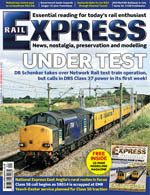 • News: DB Schenker takes over the Network Rail test train contract, but has to call in DRS Class 37s in its first week. Class 50s for Yeovil to Exeter open access loco-hauled service? HS2 review says no to Heathrow station, and proposes Old Oak Common for interim London terminal. October will see a Channel Tunnel run for DB ICE3M high-speed trainset. Just a skeleton staff will remain at Bombardier’s Ashford workshops as work on the Class 442 EMUs and the London Overground Class 378 fleet nears the end. 3-CIG Freshwater is to move to the Mid-Norfolk Railway in the autumn. Metrolink trams will be heading for Oldham and Rochdale town centres in 2014 and Manchester Airport in 2016 following the award of £500 million in funding. • News in pictures: Direct Rail Services runs bagged cement trial in Scotland, Freightliner helps out as the wires come down in East Anglia, Class 20s and Class 73s congregate at Peterborough and there are extra ‘Golfex’ trains to cope with the crowds visiting St Andrews for the Open golf Championship. • Feature: NXEA’s Rural Routes operation is one of the good news stories of the economic downturn, despite the region being amongst the worst hit by the recession. Murray Brown went to meet the people in charge of the operation to see what makes it tick, with a special emphasis on the planning for the loco-hauled Airshow ‘shuttles’ which take place every August. • Pictorial: The inevitable has finally arrived, and the first Class 58s have been consigned to oblivion, following the sale of seven of the BREL-built Type 5s in a DB Schenker tender a few weeks back. The news isn’t all bad, as one of the machines has been purchased for preservation, but the remaining six will all be disposed of. RAIL EXPRESS looks back over the life of these ‘Bones’ and salutes their brief, but interesting, careers. • Railtours: Spitfire Railtours took a Class 33 to Whitby in the period under review – but where were all the passengers?. Plus our comprehensive railtour listings for the next month. • Preservation: Alycidon lives up to its name with a series of high-speed runs on the GCR in July. Plus we take a look at the exciting line-up planned for the Mid-Norfolk Railway’s Class 37 event in late-September. It promises to be a memorable weekend! • Time Traveller: After decades of decline, Newcastle’s rail users were given a boost in 1980 as the new Metro system opened between Haymarket and Tynemouth. • Columns: Your favourite in-depth monthly reading – Messroom, Traction & Rolling Stock, Unitary Authority, Coaches, Wagons and Irish Angle, complete with superb supporting photography. • Modelling: With the Scalefour Society’s Scaleforum event fast approaching, there is plenty of coverage of the show’s diesel and electric era friendly line up. One of the layouts that will be attending, Birmingham Moor Street, which represents the West Midlands station in the 1960s or 1970-80s period, is our main feature this issue. We also take a close look at the new Bachmann Cravens Class 105 DMU and Dapol’s 4mm scale ‘Megafreet’ container flat wagon. Plus the usual news, exhibition diary and Mostyn serial. On sale via subscription and specialist distribution now. This entry was posted on Thursday, August 19th, 2010 at 9:15 am and is filed under News. You can follow any responses to this entry through the RSS 2.0 feed. You can leave a response, or trackback from your own site. Just wondering if there is any news on the print quality of the magazine now? 171 had a few ropey prints in it, but unfortunately RE 172 has many more sub standard and very poorly coloured shots in it. RE is my magazine of choice primarily due to the high quality of prints, but I must say with RE 172 especially I feel I’ve thrown the cover price down the drain. It was great to have the magazine on time, but not at the expense of quality.